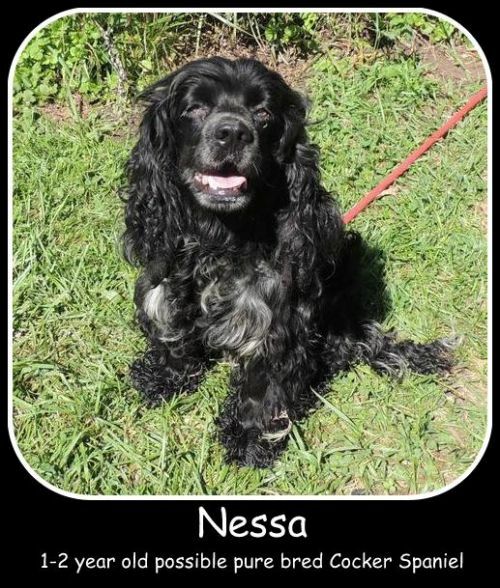 Nessa is a Cocker Spaniel, possibly pure bred, that is about 1 year old. She was found as a stray running through traffic. This sweet girl is now safe with us in foster. She is friendly and way overdue for visit to the groomers so u unfortunately some of her beautiful hair will have to be cut. She will require regular grooming to keep he looking beautiful. She is good with other dogs as and cats and seems to be comfortable in the house and yard. Nessa is UTD on all shots and tested Ng for heartworm and Lymes. She will be spayed before adoption.